Each time Kleiner Perkins’ Mary Meeker updates her web analysis, everyone listens. No surprise — her famously detailed decks are compelling enough to grab your attention and hold it for 100+ slides. Early on, she points out what I thought was the biggest takeaway from this round…that while the World economy stumbled a few years back and is just now recovering, the US technology economy expanded rapidly and decisively beat the competition. The country that sneezed, causing everyone else to catch a cold, benefitted enormously from several aspects of technology growth over the past four years. Where we stand today, 80% of top ten global Internet properties are based in the U.S., even though 81% of their users are elsewhere. That’s a significant statistic and one likely to increase going forward. There isn’t a real international challenger to Google, Microsoft, Facebook, Yahoo!, Wikipedia, Amazon or Apple. China may have the numbers for domestic use of Baidu, for example, but it doesn’t garner international market share (and won’t as a censorship tool for the state). 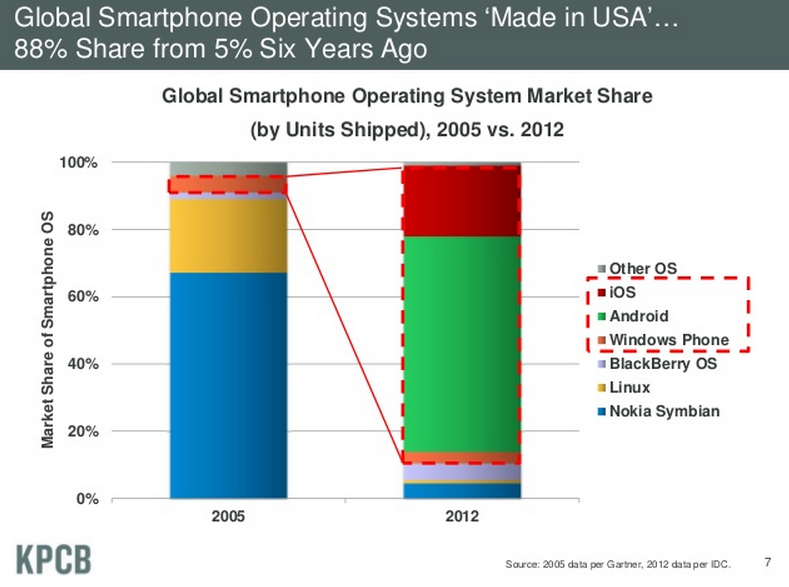 Where the U.S. has truly cornered the market is in smartphone operating systems. The U.S. shifted from a mere 5% marketshare in 2005, led by Windows, to a whopping 88% in 2012, led by Apple’s iOS, Google’s Android and Microsoft. Those are remarkable numbers at a time when mobile technology is coming into its own at an startling rate. The U.S. is strongly positioned to use their smartphone dominance to consolidate gains on convergent laptop/tablet/smartphone/ platforms produced by Apple, Microsoft and Google. As photo and video sharing explode along with Big Data in nearly every area of the marketplace, these platforms will become even more indispensable as the means to share and interact with shared content. There has never been a better time to be dominent in mobile and I predict that Apple and Android will disproportionately benefit from their position, to the detriment of everyone else. Blackberry? Done. 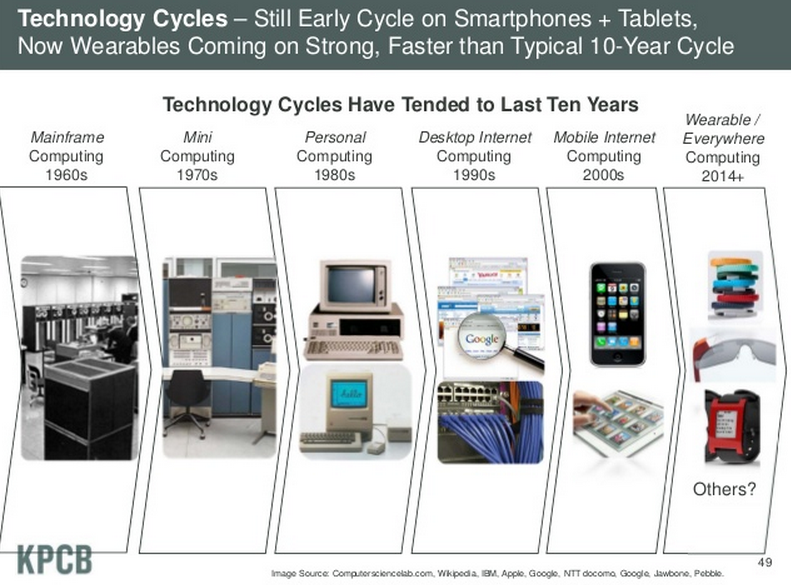 In what was an interesting tidbit, Meeker pointed out that wearables arrived recently ahead of the typical 10-year cycle for new platforms, arriving before tablets and smartphones ran their course. The appeal of devices that don’t require hauling a device out of a purse or pocket is simply too strong in a world getting used to having full computing power on the go. It’s hard to say where wearables are going, but it is easy to predict that future form factor will need to match lifestyle. Apple’s Tim Cook recently make a revealing statement when he talked about Google Glass. He pointed out that people don’t actually like wearing glasses. I’d argue the popularity of Lasix proves him right. He argues that a wristwatch or other device that is easy to use without obstructing the user’s face makes more sense. Her presentations never cease to provoke thought and discussion and this one is no different. Your comments are welcome.